A spot of botany, anyone? Stories like that completely captured the imagination of Kay and the rest of All Seeing Eye. 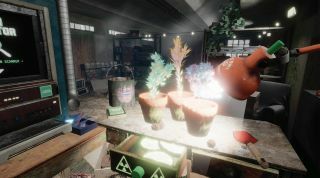 The small studio’s game, Seed, is a virtual reality project where you can breed and grow procedural plant life, either to complete missions or to enjoy a playful sandbox. As well as appealing to fans of pottering about in sheds, Seed scooped top honours (and $150,000) in a competition held by Wellcome and Epic Games which focused on using scientific ideas in entertaining games. The concept of garage biotech—where amateur plant breeders were developing their own varieties of plants at home in their own sheds and greenhouses – was introduced to the studio by Dr Helen Anne Curry, a senior lecturer in the history of science at Cambridge University and a key collaborator on Seed. The specific terminology is relatively new—garage biologist, biohacker—but, as Curry points out, there is a long tradition of amateur experimental biology. In order to represent plant breeding the developers broke the practise down into simple steps: growing a batch of plants; observing their characteristics; selecting the ones with the most desirable attributes and then going back to step one to grow the new batch using the selected crop as parents. Extra stages where you can induce mutations or crossbreed plants could be slotted into this basic cycle. The radium-dial clocks actually make an appearance in the game, as does a technique which uses the plant alkaloid colchicine to alter chromosomes. My own gardening experiments have taught me that sometimes seeds just don’t grow, or they behave in some unexpected, willful fashion. That’s not the case in Seed. “It’s really important that a player’s actions are always positive and that players always feel like they’re making progress. Plants grow quickly and predictably—there’s never any duds or seeds that just don’t grow,” says Kay. Real plant breeding can also be fiddly – seeds can be tiny and processes can involve delicate work using tools like tweezers. In VR, that level of precision would be a problem, so the team don’t design any objects smaller than a ping pong ball. “For this reason, when a player wants to make a new hybrid from any two seeds they put them both in a big microwave-style machine, close the door and press the big green button,” says Kay. “Using the historical material as inspiration to create a compelling setting and story but not being slavish to it seemed exactly right,” adds Curry. The current solution is a lot of contextual voiceover work as a guide when you start, plus “subtle visual indicators designed to push the player towards certain objects and interactions”. There’s still work to be done on that front, he says, but the approach to imparting that information may have a knock-on effect in Curry’s own work.